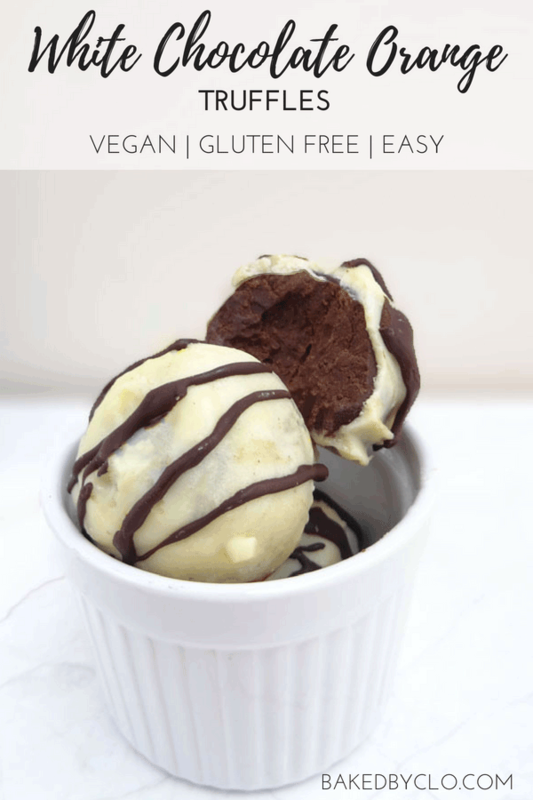 These vegan white chocolate orange truffles are rich, creamy and fudgy, and make a wonderfully decadent snack. They taste just like the famous Terry’s Chocolate Orange, except with a sweet white-chocolate coating. They are perfect for giving as a gift or just for those times when you need a little pick-me-up. And with only a few ingredients, they couldn’t be easier! You know those days where you’re just in need of a chocolatey snack? Today was one of those days for me. OK, maybe every day is one of those days for me… but today I really NEEDED chocolate. I saw a picture of some beautiful truffles on Pinterest a few weeks ago and I’ve had many-a-daydream about truffles ever since. Today was the day that I finally decided I’d make them. I love having easy, portable snacks stocked up in my fridge. Especially for days that I’m rushing out the door or in need of some quick post-workout fuel. And that’s why I love this recipe. 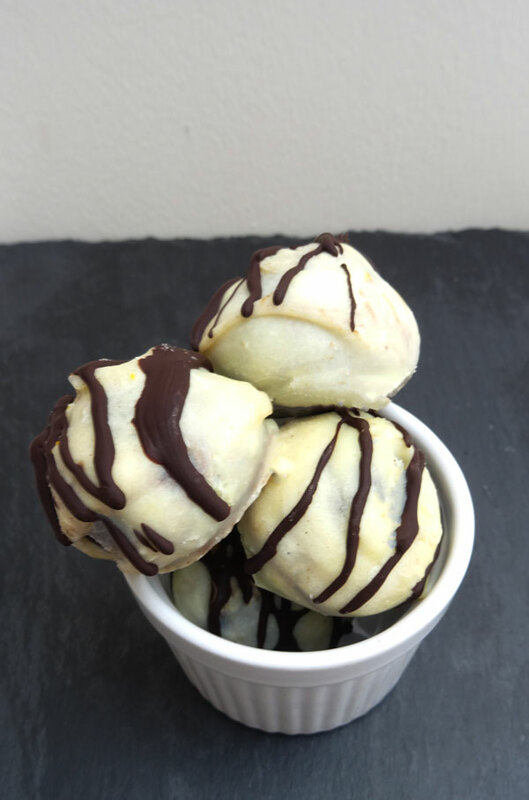 These white chocolate-orange truffles are so handy for a quick bite, and I find the cacao from the dark chocolate filling gives me a good energy boost. 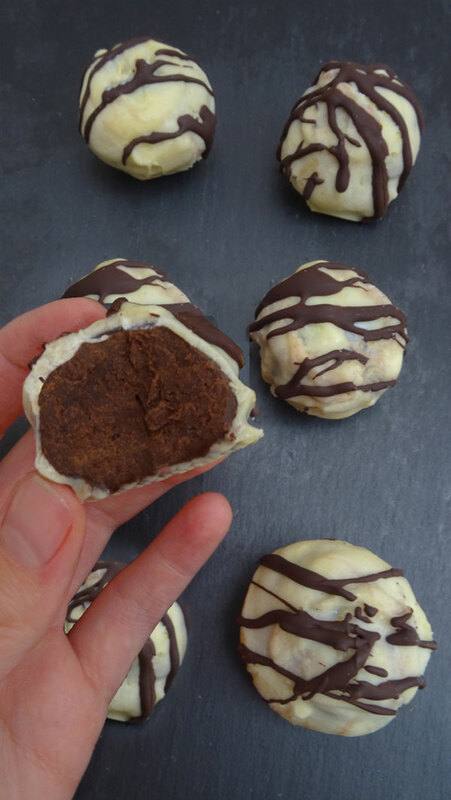 This white chocolate orange truffle recipe is the most basic truffle recipe- I just veganised and jazzed it up a little. You only need four ingredients: dark chocolate, coconut milk, orange extract and white chocolate. The sweetness of the white chocolate compliments the sharpness of the orange and the bitterness of the dark chocolate sooo well. The reason I used dark chocolate for the filling rather than white is because white chocolate tends to be of lower quality. Especially vegan white chocolate, which is hard to come by in itself. This means it doesn’t melt as nicely and I find that dark chocolate does a better job at providing that rich, velvety texture that truffles are best known for. Get the highest quality of dark chocolate you can find, one with a high percentage of cacao. I like Tesco’s 85% chocolate and it works really well in this recipe. The fat in the coconut milk provides a beautiful, creamy consistency and it makes for the best truffles, in my opinion. You can’t taste the coconut flavour at all but if you’d rather use something else, I’d recommend soya cream. I hope you love these truffles, whichever flavour you decide on. If you have any more flavour ideas, let me know so I can give them a try! 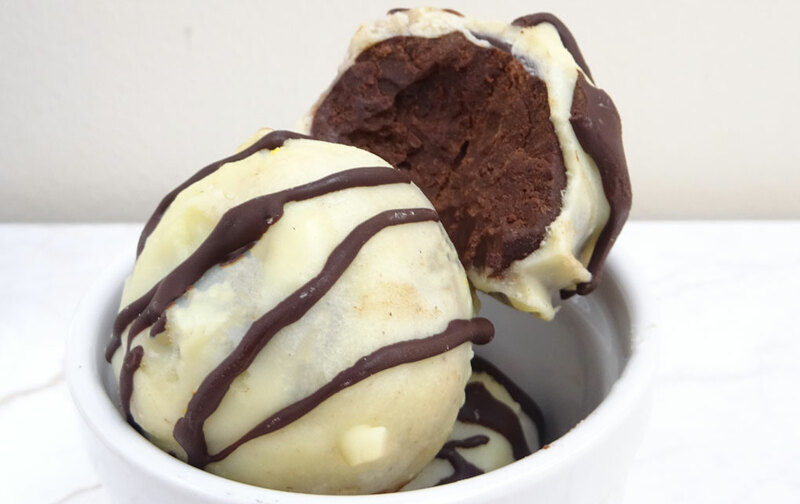 Decadent chocolate-orange flavoured truffles with a sweet white chocolate coating. Perfect for an after-dinner dessert. Over a very low heat, melt the dark chocolate then stir in the orange extract. Gently heat the coconut milk until bubbles start to form at the sides, then pour it over the chocolate mixture. Leave to sit for 5 minutes then mix together until smooth. Transfer mixture into a small baking dish and place in the fridge for 45 minutes. 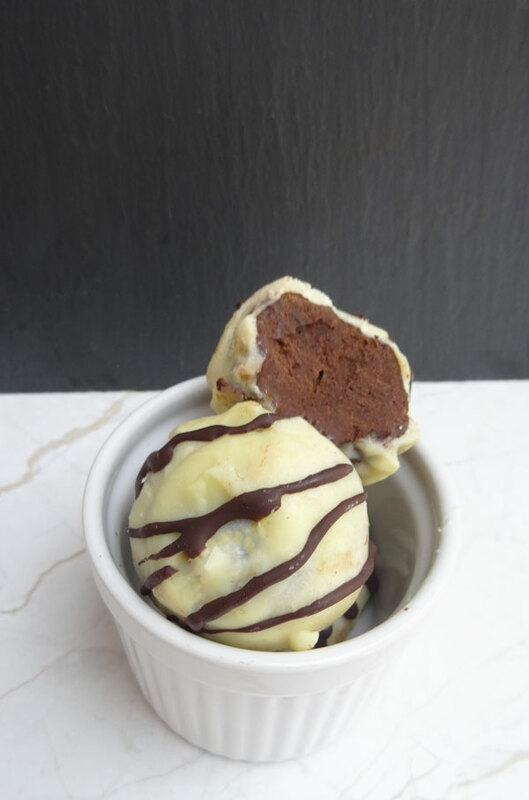 Scoop the chilled mixture out, 1 tablespoon at a time, and roll into small balls. Place in the freezer for 5 minutes while you prepare the white chocolate. Gently melt the white chocolate in a pan then dip each truffle until covered. Place in the fridge for 1 hour to set. If desired, melt dark chocolate and drizzle a little over each truffle. Refrigerate until the drizzle hardens before enjoying.